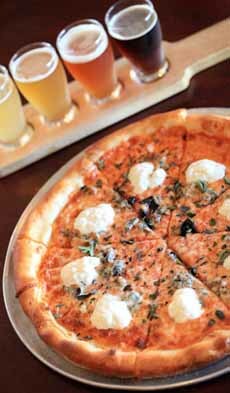 The Craft Beer Association has applied its expertise to pizza pairing. Why not? Wine connoisseurs match the flavors of wines to dishes, to the nth degree (we know: we’re one of them!). …along with our recommendation for a tasting party (photo #2). 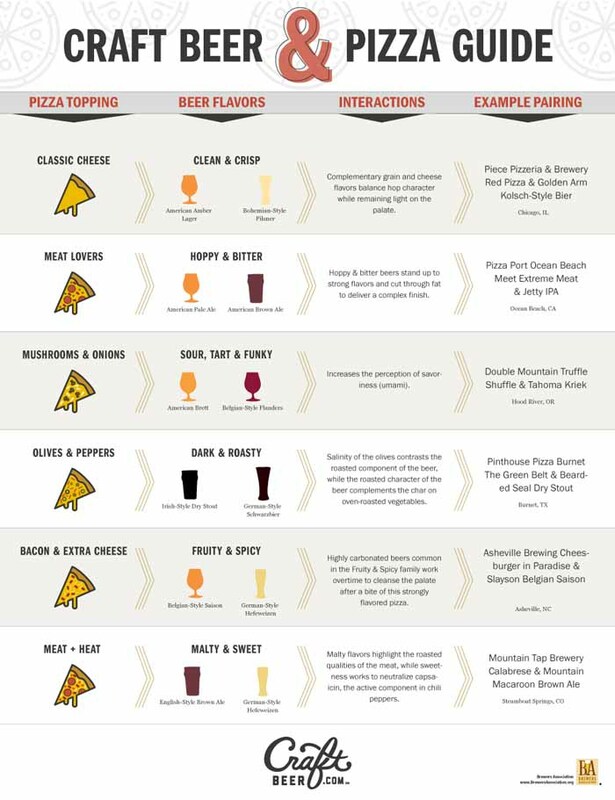 While you may not be able to taste all six pairings at once, break down the list, perhaps into pairs: two pizzas, four beers. See what you think about the recommended beer pairings, versus the other two beers. Beers: Clean and crisp styles such as American Amber Lager and Bohemian-Style Pilsner (photo #1). Why: The complementary flavors of grain and cheese balance the hop characters, while remaining light on the palate. Beers: Hoppy and bitter styles such as American Pale Ale and American Brown Ale. Why: Hoppy and bitter beers stand up to strong flavors and cut through the fat of the meat. Beers: Sour, tart and funky beers such as American Brett and Belgian-Style Flanders. Why: The savory, umami flavors in the beer increase the earthiness of the mushrooms. Beers: Dark and roasty styles such as Irish-Style Dry Stout and German-Style Schwarzbier. Why: The roasted character of the beers complement the char on the roasted vegetables; the salinity of the olives is a contrast. 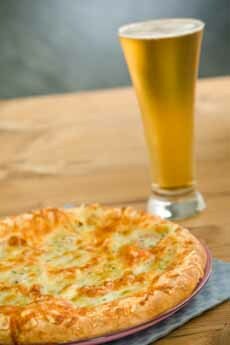 Plain cheese pizza with a Pilsner (photo courtesy Men’s Fitness). Tasting different beers with the same pie at Bowery-St. Beers: Fruity and spicy styles such as Belgian-Style Saison and Spiced/Pumpkin Ale. Why: Spicy/fruity, highly-carbonated beers cleanse the palate after a bite of strong flavors. Beers: Malty and sweet styles such as Barleywine, English-Style Brown Ale and Stout. Why: Malty flavors highlight the roasted qualities of the meat, while the sweetness works to neutralize the capsaicin in jalapeños and other hot chiles.